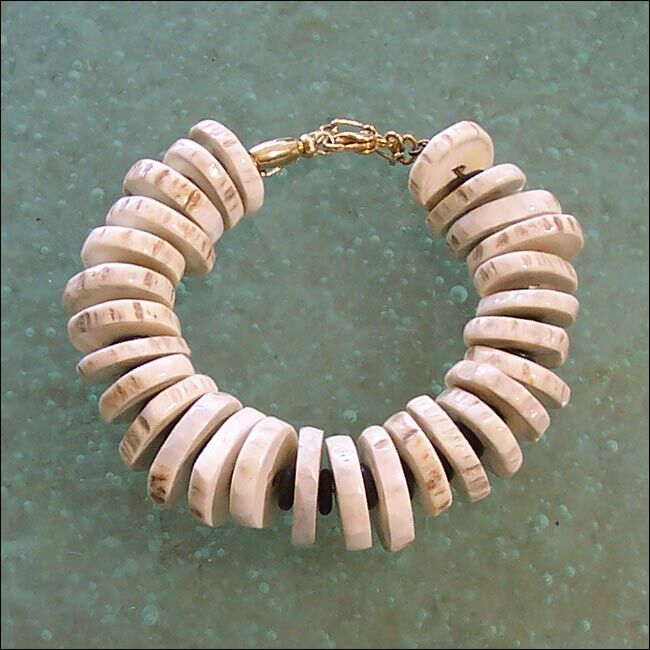 “Deery” Bracelet: This Fashion Accessories Bracelet has Chunky Jewelry Written All Over It. The Large White Beads Were Handcrafted by a Hill Country Artisan…Hand-Cut, Hand-Polished and Hand-Drilled from Antlers of the Axis Deer. Hence, “Deery” Bracelet. These Distinctive Deer, Originally Brought to Texas From India, Roam Freely Just Outside the Doors of the Artisanaworks Studio. These Irregular Round Disc Beads are Strung With Small Wood Disc Spacer-beads in Black. Brass Lobster Claw Clasp and Safety Chain. One-of-a-Kind Artisanawear Beaded Jewelry for the Artsy Girl. Designed and Handmade by Carol Tate in the Artisanaworks Studio, Texas Hill Country, USA. Please See Fashion Accessories – Jewelry Necklaces for Co-ordinate.